Fun realistic metallic look silvery gray and black metal-look fake hollow plastic chain with 5.25 x 6.75-inch (13.13x16.88cm) adult size handcuff shackles, perfect for adding to life size dungeon horror props, cosplay costume accessories and Halloween haunted house room decor. Faux distressed industrial metal-look hollow plastic links with manacles are just the right ghoulish touch for any haunt! Perfect addition to any stage and theater prop building projects. Approx approx. 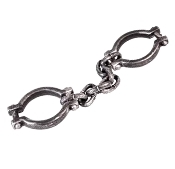 21-inch (52.5cm) Long Chain with Shackles, each 5.25 x 6.75-inch (13.13x16.88cm). 5 individual jumbo links between each shackle, each approx. 3-inch (7.5cm) long x 1.75-inch (4.38cm) wide.